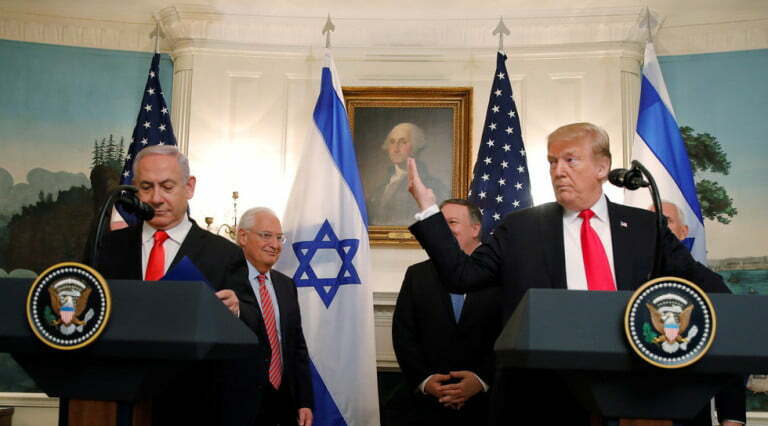 It is counterintuitive to say that the latest action from the White House would make America great again, but surely, the full recognition by Donald Trump about the Israeli supposed legitimacy over the Golan Heights is just a symptom of the cancer that has plagued Washington DC since its founding. But it is only much clearer now due to this indispensable decentralized medium called the internet. So, what are the real reasons why Donald Trump must do what he just did? Right after the controlled demolition of World Trade Center, which deterred the global announcement of the return of the Collateral Accounts to its rightful owners and the parallel transfer of these sovereign assets, mostly in gold bullion to underground vaults, the offended parties sprang into action and began their systematic legal, financial and armed attacks against the Deep State wherever they can. These clandestine operations involved the shutting down of deep underground military bases, exposure of bank interest and rare earth price riggings, mafia money laundering and pedophilia scandals involving the Vatican and its puppets, etc. Even today, we can still see China and Russia buying off all gold production outputs to deplete the world’s gold supply available for the Deep State. These explain why, in spite of these massive exposures, the Deep State is acting desperately in many resource rich regions in the Middle East, i.e. Golan Heights for access to Levantine Basin natural gas deposits, and in Latin America, most actively, the ongoing regime change operation against the Venezuelan Maduro government, for the subsequent access to the energy rich Orinoco River. It’s the 11th hour for the financial survival of the Deep State, and it has no other choice but to do the only option left for the criminal enterprise, i.e. seize all sovereign assets deposited in their vaults. More than US$30 billion were illegally diverted from Venezuela in two months, the country’s communications and information minister has revealed, accusing the US of orchestrating the operation. Around $1 billion of the stolen funds from national assets in international banks was transferred to the personal accounts of opposition leaders, according to Communications and Information Minister Jorge Rodriguez. The money is meant to finance “terrorist cells against the country,” he added. “They have resorted to stealing the assets that Venezuela holds in different banks. This money is being confiscated at the request of the [US President Donald] Trump administration. Over $30 billion has been stolen in the past couple of months,” Rodriguez said on Saturday as citedby VTV state television. The scheme was allegedly coordinated by US-backed opposition leader and self-proclaimed ‘interim president’ Juan Guaido, as well as his key aids – Leopoldo Lopez, and the recently detained Roberto Marrero, among others. Information gathered from Marrero’s cell phone indicates that Venezuelan lawyer Juan Planchart received some part of the stolen money, according to the minister. Last week, Venezuelan President Nicolas Maduro accused “the devil’s puppet” Guaido of plotting his assassination. Earlier in March, he accused Washington of stealing $5 billion in Venezuelan funds allocated for buying substances necessary for medicine production and their delivery to hospitals and pharmacies. The US has been tightening sanctions and economic pressure on Maduro’s government and openly calling for regime change, while pledging support to Guaido. Last week, the Treasury Department slapped the country with sanctions on state-run mining company Minerven and its head, Adrian Antonio Perdomo Mata. Other restrictions target the Venezuelan oil sector, which is crucial for the country to keep the economy afloat, as oil revenues account for about 98 percent of its export earnings. Citigroup is reportedly preparing to sell gold bullion – which the Venezuelan Central Bank swapped for cash back in 2015 to keep the economy afloat and has now missed the deadline to buy back – and it wants to keep the change. The American multinational investment bank has decided to sell off tons of Venezuelan gold reserves after the country’s Central Bank (VCB) missed the March 11 instalment to purchase back the collateral deposited to the British unit of Citibank over three years ago, in exchange for a $1.6 billion loan, multiple sources told Reuters and Bloomberg. The sale could fetch more than $1.35 billion under current market conditions, which is way more than the $1.1 tranche payment Citi was waiting to receive from Maduro’s government. Instead of returning the excess to Caracas, over $250 million in spare change will be deposited into a bank account in New York, where the US has already placed a giant claw over seized Venezuelan funds. Venezuela declared a force majeure, arguing that US sanctions and assets seizures prevented the country from paying back the loan on time, but the bank reportedly refused to extend the grace period. Citigroup and VCB have yet to issue a comment on the reports. Earlier this month, self-proclaimed ‘interim president’ Juan Guaido reportedly approached Citibank urging them to block any attempts by Caracas to repurchase gold in order to ‘safeguard’ Venezuelan peoples’ riches until the opposition can get a hold of them. The US-backed politician also reportedly urged the Bank of England, which holds around $1.2 billion-worth of Venezuelan gold, not to transfer the reserves back to the Maduro government. Pirates don’t have to look like Johnny Depp in Pirates of the Caribbean. They can fly the Union Jack rather than the skull and crossbones. They can be called the Bank of England rather than the Jolly Roger. The ‘Old Lady of Threadneedle Street’ is a port in a stormy world for all kinds of countries in which to moor their national wealth. And it’s not even necessarily voluntary. After the fall of the communist regime in Albania, I had a brief tenure as joint chairman of the Britain-Albania Society with the Tory MP Steve Norris. He and I had to move mountains to try and persuade the British government (which then entirely controlled the Bank of England) to give the Albanians back their gold, which had been seized by the British during Second World War. This week’s brigandry – unnoticed by any commentator I read – took place in an era when the Bank of England is officially independent of government control. And yet it was triggered by a phone call from a foreign government official. The bank’s decision to seize – a polite word for steal – more than a billion dollars’ worth of Venezuelan gold was reported to have been ordered by the governor after a call from US National Security Advisor John Bolton and Secretary of State Mike Pompeo – not even the president himself. If I’m right, then this decision to damage – hopefully irreparably – the safety of deposits in the Bank of England was taken by an unelected, unaccountable Canadian citizen (who only got his British citizenship in November). He is here today but gone tomorrow as the governor of the Bank of England. The foreign policy of the state – whose bank it is – was thus at least anticipated if not usurped by Bolton, a minor official of a foreign country. The freezing of Venezuelan gold by the Bank of England is a signal to all countries out of step with US interests to withdraw their money, according to economist and co-founder of Democracy at Work, Professor Richard Wolff. “That is a signal to every country that has or may have difficulties with the US, [that they had] better get their money out of England and out of London because it’s not the safe place as it once was,” he said. What this financial desperate moves by the Empire mean is that the rest of world no longer recognize the sham Western fiat currencies unless it is backed by hard assets, and therefore, these robber barons’ banks must do the only thing they know how, i.e. rob their own depositors’ hard assets and shut the media down from ever talking about it. In recent weeks, the Deep State had already acquired 50 tons of gold from Syria through their ISIS operations there. Now, Donald Trump deems it the right time, i.e. Americans are still shocked and other side celebrating the nothingburger conclusion of the Mueller investigations, to full recognize Israel’s right over the entire Golan Heights. Back in reality, the Golan Heights is recognized as Syrian territory in international law, having been seized by Israel in a land grab during the Six-Day War in 1967 and later officially annexed in a 1981 Israeli law. It doesn’t belong to you. It’s Syrian. The Golan Heights is Syrian, NOT Israeli. You are land thieves. The New York Times editorial board called Trump’s move a “pointless provocation” and said it had “more to do with Israeli politics than American interests.” It also just so happens that there are some great big oil reserves in the area and, well, you can do the math. The NYT is 100 percent correct, but the newspaper hardly deserves high praise for taking such a stance, having been a cheerleader for illegal US military interventions all over the world during the last two decades. But American journalists don’t seem to do irony, having just spent the better part of three years accusing Russia of “meddling” in a US election, while diligently ignoring the blatant fact that the US has been the world’s meddler extraordinaire for decades. Only, the Washington meddlers don’t do it with Facebook memes and Twitter trolls, they engineer violent coups, overthrow democratically elected governments and install military dictatorships, all while preaching ad nauseam about democracy and human rights. Of course, it is the Deep State that is doing all of these machinations and Donald Trump, although he might have been thinking that he could make a difference to the economic plight of the Americans somehow, but really is just another small player in the entire ballgame. You just have to look at who are those surrounding him right from the start of his day in the Oval office. Surely we can romanticize the last two years in any way we can, but the Vice movie always comes to mind. The objective behind the full recognition of Israel’s “sovereignty” of the Golan Heights has more to do with what is sitting beneath the Levant, most specifically the Levantine Basin, i.e. 1.7 million barrels of recoverable oil and a mean of 122 trillion cubic feet of recoverable gas according to the USGS survey. Yes, the United States Geological Survey’s primordial function is to look for exploitable resources where American geopolitical and military forces have access to, or that they will make them accessible to in the future. With reference to the above map, Lebanon needs to be acquired also by any means necessary. This makes the directed energy weapon really more indispensable. Again, as we said in an earlier post, the Alliance has already accepted the limits of the US presidency, and now China is negotiating directly to the real decision makers of the West in Malta about where the world should go from here, while Russia is enforcing its red line warning against the Western pirates in Venezuela. We cannot sit idly, however, by just watching the power hungry establish a “new economic order” that is still way off course to the full utilization of exotic technologies that could effectively end the monetary based control system. What to do with our collective technological evolution is not for them to decide on. These are gifts that were freely given by our scientific pioneers to enable mankind to move forward peacefully and abundantly. The corporate governments’ suppression towards large scale free energy systems must end now. Defund the criminal cabal and accelerate its demise by boycotting Big Pharma for good.